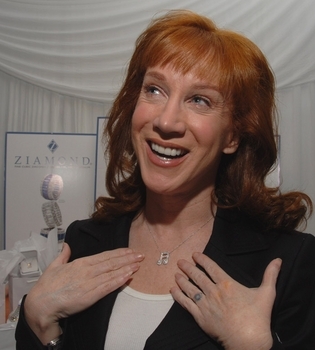 Actress and Comedian, Kathy Griffin is an �A lister� in our book! She is wearing a music note pendant called the Ziamond Musique Note Pendant in 14k gold and cubic zirconia cz. The Musique Note Pendant is inspired and worn by many celebrity musicians and singers. See item P1085 or http://www.ziamond.com/pn1002.html. If you have a love for music, this is definitely a "must have!"